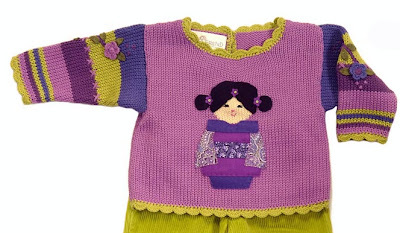 Japanese inspired clothing has become a leading trend in the children’s fashion industry. With beautiful kimono designs, contrasting colors and elements taken from Japanese culture and lifestyle, its easy to see why the trend has become so popular. We’ve put together a list of some of our favorites ranging from infant to boys and girls wear. 1. Tea Collection’s Daily Tea Set – Miyako ($129 for 6 pieces). Sizes XS (3-6mo) to 8 yrs. 2. Tea Collection’s Seoul tee in indigo ($19) and French terry pants in herb ($28). 3. Noko’s Haname Satin and Velvet Dress in purple ($99). Available in infant and toddler sizes. 4. Tea Collection’s Winter Wonderful Sebastian Set ($129 for 6 pieces). Sizes XS (3-6mo) to 5 yrs. 5. The Belle Booties– red and white floral kimonos. ($32). Sizes from 0-3 to 12-18 months. 6. Dragon Tail Baby Turquoise Kimono One Piece ($40) in sizes ranging from 0-12 months. 7. Harajuku Lovers School Baby 2Fer (on sale for $21 at Tutti Bella). 8. Tokodoki Samba Onezie (28.95). Sizes available from 3-6 months to 12-18 months. Available in sizes 2T-6, this sweater from Sam’s Friend Holiday Collection is Japanese inspired, cuddly and oh so cute!